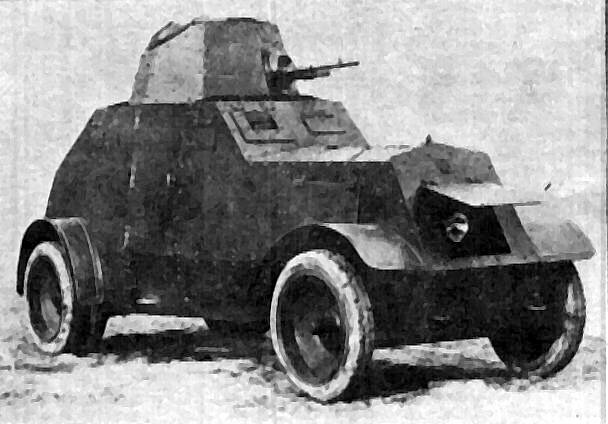 In 1929, the Polish general staff, not satisfied with the wz.28 light half tracks, ordered the Wojskowy Instytut Badan Inzynierii (Institute of Military Engineers) to design a new model. The team was led by the famous engineer Lt. Rudolf Gundlach, who invented and sold the licence of the reversible tank periscope to Vickers, a worldwide instant success. A sturdy basis was chosen, the licence-built Ursus two ton truck, based on the Italian SPA 25C, already in production at “Ursus” Mechanical Works of Warsaw. The heavier, higher, stronger and more powerful vehicle was officially designated samochod pancerny wzor 29 (shorteneted as wz.29 and dubbed “Ursus”). 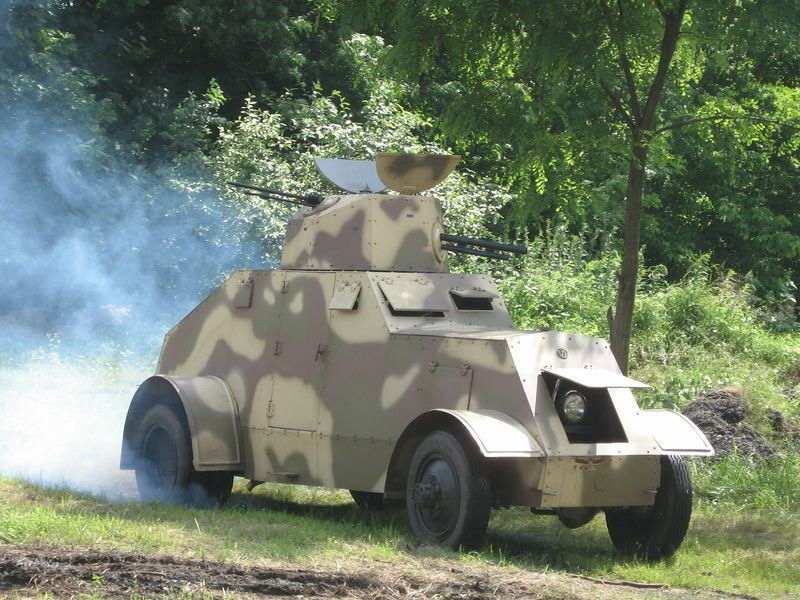 The wz.29 was based on a sturdy truck chassis, with an increase in armor and armament over previous models. As such, the “Ursus” was given no less than three machine guns and one low-velocity 37 mm (1.46 in) wz.18 L21 cannon, all of French origin. The 37 mm (1.46 in) was a classical SA 18 Puteaux gun built in mass for the army during the last stage of the First World War (used in many tanks, like the FT) and after. The machine guns were the wz.25, also a WWI classical model. These were reliable, but the rate of fire was limited and the turret mount could only be aimed alternatively. This system was far less practical than having a coaxial machine gun and was the major drawback of this design. The heavier armor of the Ursus also resulted in poor speed and high consumption (thus relatively short range) and off-road capabilities were limited by the rear-drive transmission. A third machine gun was initially mounted on the top of the turret, but as it was not practical, from 1935, all were dismounted, leaving only the fixed one at the rear and the one in the turret. Motorization was assumed by the petrol Ursus-2A, a reliable 4-cylinder, 4-stroke, water cooled engine with 2873 cm3 and 35 hp at 2600 rpm, derived from the Italian SPA 1913 motor. With no modification, it had to carry nearly 5 tons in battle order. Due to their low speed, high profile, limited internal space and soon obsolete gun arrangement, only ten (thirteen according to other sources) were ultimately built and commissioned in 1931. A successor, the wz.31, was designed, but rejected. These vehicles were deployed in three car platoons and given to the cavalry corp. They practiced daily maneuvers with the fast tankettes, through often changing affectations. In 1936, their AA machine-gun was dismounted and they received a new camouflage livery. In August 1939, eight Ursus were deployed in the newly formed 11th Armored Unit (dywizjon pancerny), Mazowiecka Cavalry Brigade, Army “Modlin”, for scout duties. They performed well, occasionally engaging light German infantry and motorized units without any casualties. But on 12 September near Seroczyn, they encountered and skirmished with the vanguard Kampfgruppe “Steiner”. As two German vehicles were destroyed, one Ursus was shot and disabled by one of the German 37 mm (1.46 in) AT guns, and the entire unit retreated. The Germans ultimately pushed them across the Swider river. Regrouping, gathering other units including tankettes, gun and infantry support, commander Maj. Majewski, tried unsuccessfully to retake the village beyond the Swider. The commander car was lost due to heavy fire, as another leading car and two others were badly damaged. Most of the tankettes and two wz.34 cars were also lost. The depleted unit finally tried to join the Army “Lublin”, but the armored cars were caught in sandy terrain and bogged down. They were destroyed by their crews. It is doubtful that the Germans ever attempted to salvage and repair them for police duties. A 1935 wz.29, seen in Bydgoszcz with the 8th Armored Battalion, showing the regular “Japanese style” camouflage, with bright yellowish sand, dark green and dark brown spots separated by black stripes. There were also many unit identification signs and symbols used for exercises in peacetime, all removed in July-August 1936. During winter they were painted with a washable white die. A wz.29 armored car in September 1939. The new 1936 camouflage shows mostly blended horizontal patterns of less contrasted colors, grayish sand and dark brown (sepia) over a olive green base color. Interior was light olive and many lower parts, exhausts, etc. were painted black. All unit identification panels were removed.